He commented: “It looks like a wampum belt”. Trust me, it's a toe! 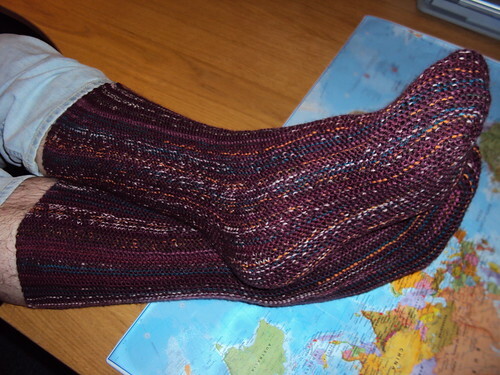 Last time you saw these, I had only completed the first half of the first sock and was wondering whether stranding a faux-fair-isle colourway with a solid colour was the best mix to show off the strange construction of the sock. After much hemming and hawing, I decided to bite the bullet and un-strand one half of the yarn I had previously wound together. This was both the best decision I could have made and one of my worst ever. I think there’s no doubt that my hunch right: completing the other half of the sock in alternate stripes of faux-fair-isle and solid was the right move, in terms of showing off the construction. But MAN! was it a PITA to de-ply 200m, or so, of yarn. It involved large puddles of yarn, all over the living-room floor. Needless to say, I did this one evening DH was away. But… it was worth it. My Work Work-Plan Plan – in which I plan to have a plan and then work to work to my plan – is all working according to plan. (hee hee, I love to I wreck heads!) I’m two days into my strategy and I’m feeling all super-productive and happy. This super-focussed-feeling is spilling into my home-life too (so I’m only allowing myself 30mins to blog) and even has me feeling I should be super-focussed on what my knitting project priorities should be. Note I say “should be” because, in reality, my inner-crafty-self is not listening to super-focussed-work-self. Super-focussed-self says I should be focussing on finishing those last few inches on DH’s GlenvarAgin Cardigan, so that I can get cracking on the sleeves – and finally give it too him after all these years. Inner-crafty-self says “Boring! Oooh look… shiny new techniques!” and promptly potters off in the direction of a crochet hook! One shiny new technique that grabbed my undivided crafting attention last week was Better Mousetrap Socks by Debbie New (above). 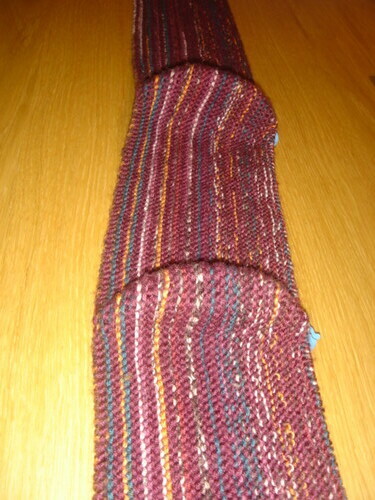 Within two days of casting on, I had completed one half of my first sock. 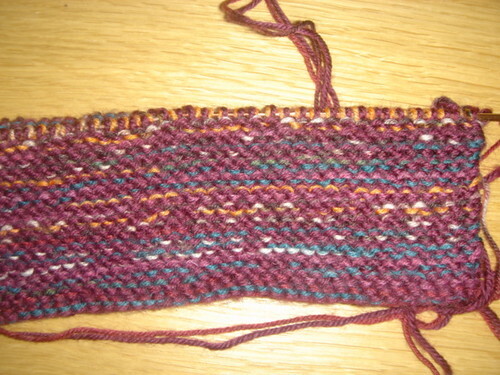 I was amazed – I don’t know if I’ve ever progressed a sock that quickly before. Trust me, it's a sock! I’m not sure that I like it. I don’t think it does enough to express the construction of the sock. 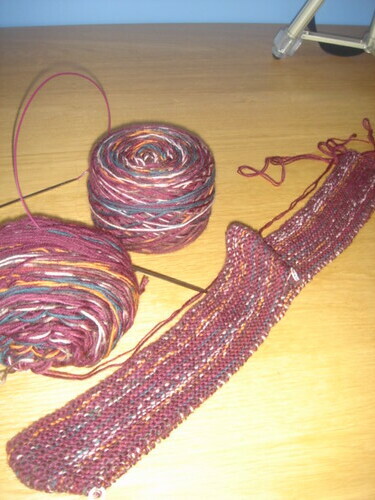 I think the overall sock will just look homogenously mottled. 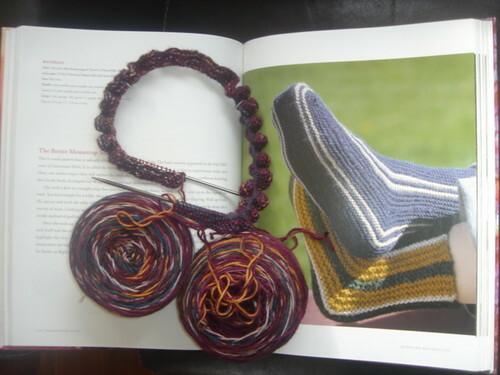 I’m of a mind to unwind the second cake of yarn and re-wind it so that the Berroco Sox and the CHO’7 are each double-stranded separately and then complete the second half of each sock in stripes of each. Would that be completely crazy looking? Should I leave well-enough alone? I’d love if you could give me your opinions, dear Reader. This is going to be a fun knit. 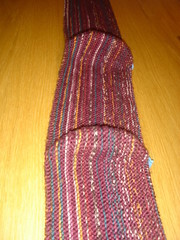 The socks are knit sideways in one long strip, with mitred decreases shaping the toe and heel. You then fold at the toe and heel and graft one half of the stitches to the other. I want these socks to be quick to knit so I’m bulking up by stranding two sock yarns together: Berroco Sox with Bergere de France CH’07. This dove-tails well with my recent drive to bust-down my stash: two pairs worth of yarn get used up in one go. This is a real turn-around for me. I’m usually really frugal with my yarn and would never consider doubling-up on yarn as it would feel like paying twice over for a project. That’s what the realisation you’re at S.A.B.L.E. does to you! 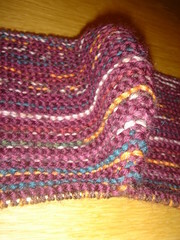 To figure out how many stitches to cast-on I had to knit a swatch and do a bit of algebra. My grand total of stitches is 246; however I’ll only have to knit about 14 ridges of garter stitch. The high quantity of stitches is a giving me grief at the moment though. The only spare cable I can find for my 3.5mm Knit-picks interchangeable needles is 40cm long. It hasn’t stopped me from starting but it’s getting a tad annoying. I already know that when I start sock 2 I’m going to cast-on to two cable needles using Judy’s Magic Cast-on. This will keep the stitches live for me and save me picking up stitches for the second half. I just need to get me to a half-decent yarn-shop that sells cables for interchangeables. Unfortunately, it would appear – so is he! 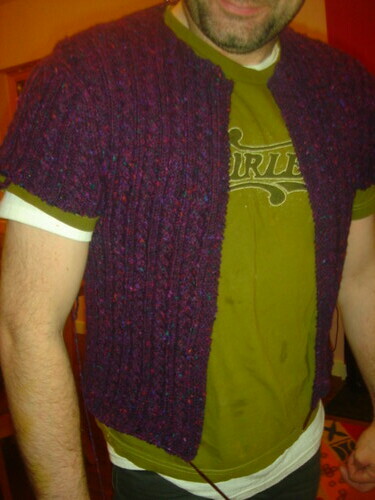 I’m kinda at a loss to explain why this cardigan fits him so well on the back and looks like it’s a foot too small on the front. The fact that it’s still on the cable needle may contribute to some of it; and perhaps when the zip is added there won’t be an issue; but I fear there’s only so much “negative ease” can do for me. Sigh! Go back up an look at the Rear View some more, there. Just admire those short-rows around the sholder-blades. Can’t see them? I know, isn’t it fabulous! If you remember my knitting plan for the year, you may recall I had planned a cardigan for DD to be done in March and a jumper for DS1 to be done in April. 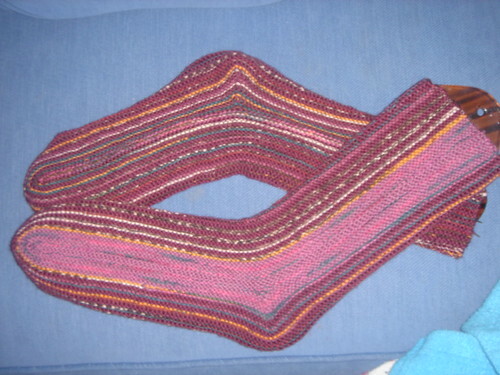 In fact, I’m not letting myself cast-on for either of these until I’m finished DH’s cardigan. Only four more inches to be added to the body and then the sleeves and I’m there. And – mark my words!!! 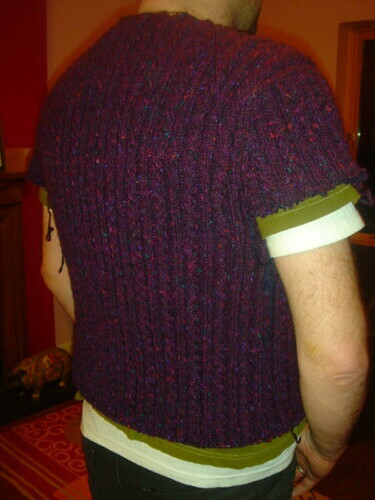 – DH can go on a starvation diet if this doesn’t fit him – I’m NOT knitting this one again! Ha ha!